Yes, it's nearly summer and we dream about sailing away on salted sea...The seagulls inspired us this thin white linen loose fit Top "Rubans" pure and light as the wind blowing on the shore, it matches perfectly with our blue "Adrien chambray Denim" sarouel pants for a casual coastal spirit...A high quality European flax, souple and strong, yet quite thin, the kind of blue you fell in love with...Take care of it and it will last long, turning into a beautiful patina ! 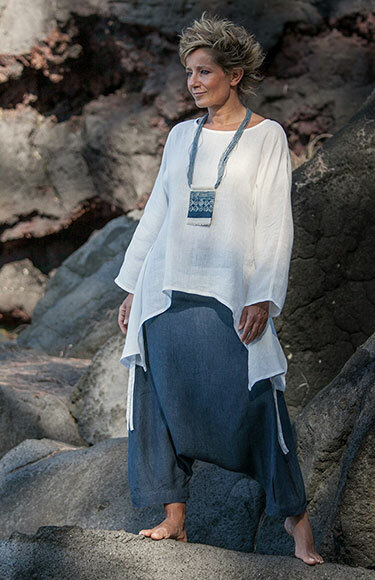 The blue necklace is made of a tick flax piece ornate with a true indigo blue Batik treasure upcycled from traditional skirts from Hmong and Dao people living in the North Vietnam mountains. 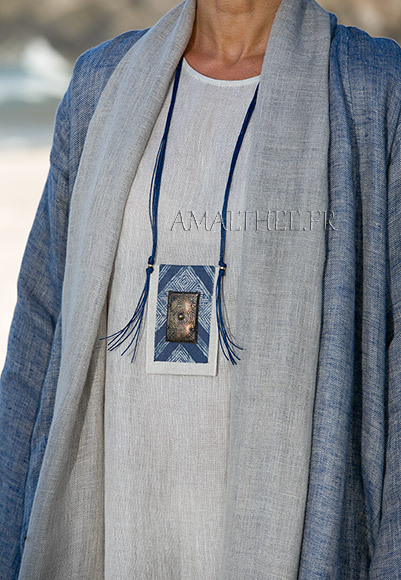 The waxed cotton cords makes it comfortable and easy to wear as a daily Talisman !